SAN JUAN, PUERTO RICO — Leovigildo Cotté died in the midst of desperation over not getting the oxygen needed to keep him alive in the only shelter that exists in the town of Lajas, which has been without electricity since the passing of Hurricane Maria a week ago. Not even his connections with the government saved him. “The generator never arrived,” said the current mayor of Lajas, Marcos Turín Irizarry, who explained that he looked for oxygen for Cotté, father of the former mayor of that same town, “turning every stone,” but could not find it. Cotté is one of the unaccounted victims of the Category 5 hurricane that devastated all of Puerto Rico last week, with its sustained winds and gusts of up to 200 miles per hour. On Wednesday, the government of Puerto Rico still held that the official number of deaths as a result of the catastrophe was 16, but the Center for Investigative Journalism (CPI, for its initials in Spanish) has confirmed that there are dozens and could be hundreds in the final count. The fatalities related to circumstances created by the hurricane are still mounting with each passing day, and official numbers are not counting patients who are not receiving dialysis, oxygen and other essential services, such as Pedro Fontánez, 79, who is bedridden at the Pavía Hospital in Santurce and who the institution is attempting to release since Saturday, while he lacks electricity at home to support the oxygen and gastric tube-feeding he needs to continue living. 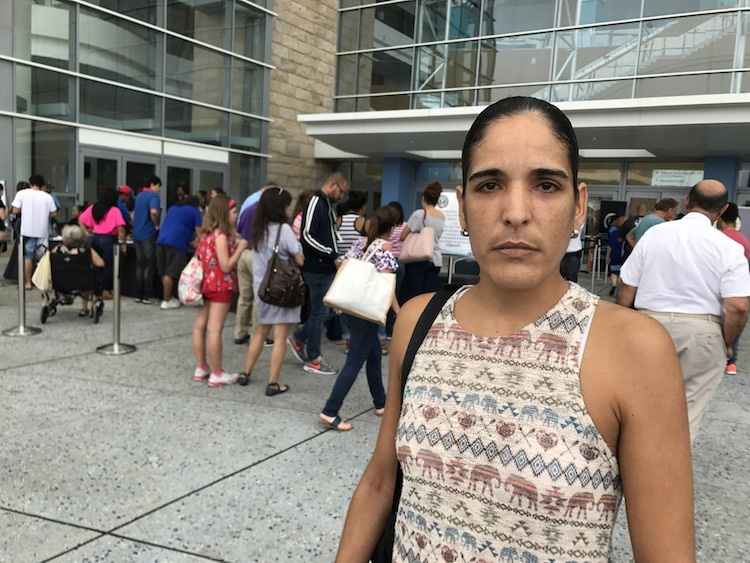 His daughter, Nilka Fontánez, showed up desperate at the government’s Emergency Operations Center asking for help, but was told they were not accepting patients there. “There’s no information,” she said, frustrated. The dead are at the hospital morgues, which are at capacity and in remote places where the government has yet to go, and in many cases, their families are unaware of the deaths. The Demographic Registry certifies the deaths so bodies can be removed by funeral homes, many of which are also not operating for a lack of resources and fuel. They barely began certifying some of the dead on Monday, as Health Secretary Rafael Rodríguez-Mercado confirmed in an interview. Public Safety Secretary Héctor Pesquera told the CPI that the names of the dead due to the hurricane will not be revealed, as the lack of communication has kept many people from knowing the whereabouts of their families. Since the hurricane, many people have gone daily to radio stations so that the on-air personalities can say the names of family members with whom they have been unable to communicate in a desperate attempt to find them. A week after Maria’s passage, the government of Puerto Rico is trying with great difficulty to supply basic services, such as fuel, roads and communications and tells the world every day of the progress of these efforts through their press conferences at the Emergency Operations Center (COE, for its initials in Spanish) established in San Juan. But the fact that is not discussed is that the number of deaths resulting from the disaster are much higher than the 16 or 19 that have been offered as the official tally. CPI sources in half a dozen hospitals said those bodies are piling up at the morgues of the 69 hospitals in Puerto Rico, of which 70% are not operating. The majority of the hospital morgues that provided information including the Medical Center in Bayamón and Santurce, Pavía Hospital in Santurce, the Manatí Medical Center, Dr. Pila in Ponce, the Río Piedras Medical Center, the Mayagüez Medical Center and the HIMA hospitals in Caguas and Bayamón, are at full capacity. Those hospitals are among the 18 that are partially operational. Furthermore, this media outlet learned that the Institute of Forensic Sciences is also full of bodies and that allegedly 25 of those are hurricane victims. On Tuesday, the IFS informed that it had increased its storage capacity for bodies with a trailer that was obtained through The Morgue federal program. It’s unclear what is happening with the deceased that are at the morgues of the 51 hospitals that have had to close their doors, with which it has been impossible to communicate. Secretary Rodríguez-Mercado acknowledged that hospital morgues are full, including the one at the Medical Center in Mayagüez. He said the accumulated bodies cannot be removed from the morgues by funeral homes until the deaths can be certified by the Demographic Registry, who barely began operating from regional emergency centers on Monday. Furthermore, the doctor acknowledged that the hurricane-related deaths are many more than those officially documented so far. As he said Monday, the three hospitals he visited that day in the island’s western region, during the first contact he was able to achieve with that region, he documented seven additional deaths “to the 19” that had been revealed so far. That same afternoon, Gov. Ricardo Rosselló said the official figure of hurricane-related deaths was still 16. To date, Rodríguez did not know the status of the situation at the hospitals in Ponce, because the region remained completely cut off from communications, but planned to go to that town on Tuesday to explore the matter. On Wednesday, the CPI learned through Ponce Mayor María “Mayita” Meléndez that the hospitals operating in that town are San Cristóbal and San Lucas. “We’re finding dead people, people who have been buried. Related to the hurricane (we have) 19 dead, which the governor reported, but [people] have made common graves. We’ve been told people have buried their family members because they’re in places that have yet to be reached,” the Secretary told the CPI, while visibly shaken. CPI sources said that in just two of the hospitals that are operating, they were they able to document a dozen deaths among patients that were transferred out of the closed-down hospitals. Furthermore, they pointed out that the problem is that patients are arriving in critical condition, with ventilators, for example, and with poorly documented records regarding what had happened at the institution where they were hospitalized. For that reason, and the limitation of resources and fuel for power generators, the majority of hospitals that are “operational” are not accepting transfers or new patients, they said. The Río Piedras Medical Center, the government’s main hospital for this disaster and the only tertiary hospital in Puerto Rico, has been operating at half capacity. Rodríguez-Mercado said Wednesday that on that same day, they would meet with specialized authorities from the U.S. Department of Health to discuss the protocols used to handle cadavers to prevent a budding public health problem. He said the current protocol for disposing bodies and vegetative material in emergency situations is managed by the Environmental Quality Board. But soon after, the president of that agency, Tania Vázquez, said in an interview that her agency only oversees the protocol related to disposing of animals, not human beings, but added that burying a dead person without a certification of the death is a crime. As of press time, Rosselló’s press secretary had not responded to a petition to clear up who is responsible for the protocol for these emergency burials. Meanwhile, the dead continue to accumulate as a result of the chaos in the health system due to a lack of diesel and the absence of a communications plan between the system’s components, and these must be added to those who are in areas that still lack communication and those in remote areas. “We’re fighting. I would love for the government to understand that it has to open dialysis centers. If they don’t receive the service, the patients’ health is compromised quickly and they die. And yes, they have died,” Armando Rodríguez, vice president of Grupo HIMA confessed when confirming that the morgues of his two hospitals in Bayamón and Caguas is above capacity. Meanwhile, thousands of doctors and nurses are literally at home unable to work, said Dr. Joaquín Vargas, president of the Puerto Rico Primary Physicians Groups Association, who was at the COE to see if the government would set up an operations center where they could at least answer calls from citizens. The CPI also learned that a large portion of specialized physicians is unable to work because hospitals don’t have supplies and the ability to conduct their procedures, nor basic resources such as fuel or electricity to run their medical practices.